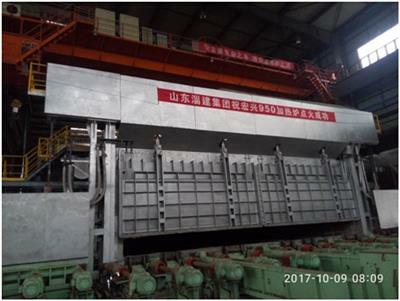 News » Project Status » 237tph reheating furnace supplied by CISDI lights for preheating at Qinhuangdao Hongxing Iron & Steel Co.
On October 9th, 9:16 am, 2017, the reheating furnace supplied by CISDI under an EPC contract for Qinhuangdao Hongxing Iron & Steel Co. in north China’s Hebei Province lighted for preheating successfully. It was the first package of the Hot Strip Mill project (Phase II) that was put into hot commissioning, thus triggering cold and hot commissioning of all the other packages. The 237tph reheating furnace of walking beam type, CISDI supplied for Qinhuangdao Hongxing Iron & Steel, is of side-charging and side-discharging, top and bottom reheating design, capable of reheating slabs for the 1.60Mtpa Hot Strip Mill. It’s blast furnace gas (BFG)-fired, equipped with CISDI patented BFG-firing double regenerative burners, with fume exhaust temperature down to 150°C. Moreover, L2 computer mathematic model-based combustion control technology developed by CISDI has been applied, making the production more flexible and providing the reheating furnace with higher automation level. At present, the on-site CISDI team is making all the necessary preparations to make sure the project can come on stream smoothly.